At mass the priest declares "This is my body" and shortly afterwards "This is the chalice of my blood...."At this moment the sacred elements become consecrated and transformed into the visible manifestation of Christ in what Benedict the Sixteenth called a transcendent mode of presence. This is a strange doctrine, but one that has great beauty, Christ manifest in the world in such a humble form. But it would certainly help if the doctrine were understood better than it is. Some years ago, the late Reverend Ian Paisley, the staunchly anti-Catholic head of the Free Presbyterian Church of Ulster, was debating his position at the Oxford Union, a renowned debating society, when he pulled out a piece of communion bread and declared that Catholics believe that this is Christ. Well, I hope that he had not got his hands on a consecrated host, but in any case,like all propagandists he was thinking in caricatures. While the church has an explanation of the real presence of Christ in the Eucharist, it acknowledges that the Eucharist is a profound mystery, the full understanding of which is beyond human comprehension. So yes,it is the body of Christ, but in a mysterious way far beyond the simplistic posturings of the likes of Dr Paisley. We adhere to this doctrine because we get it from Jesus.The gospels tell how at the Last Supper Jesus took the bread and wine and declared that they were his body and blood.In other words they were to be his physical manifestation when he had gone from sight.The breaking of bread and the Lord's Supper are mentioned in the Acts of the Apostles and the Pauline letters, so this shows that the Eucharist was central to the life of the church,which regarded it as the visible manifestation of Christ to his people. However, one thing must be emphasised. It is not the body of Christ as he was when he walked in Israel, that is believed to be present, but the risen Christ who at the resurrection acquired a glorified body that transcended earthly limitations that is present. We note from the resurrection stories in the gospels that after the resurrection Jesus seems to have been free of physical constraints and at time was not recognisable even by his close companions, and in the light of this liberation it becomes less surprising that the church accepts that Jesus becomes manifest as the Eucharistic elements of bread and wine. Some find it incredible that Catholics can seemingly fly in the face of commonsense,for surely bread cannot be a body, and they see the Eucharist as merely a memorial. But common sense is not a good guide to reality,for the world revealed by physics is far from commonsensical, and reality can be very strange to us. Can it be so surprising that God is even stranger than the created universe is? Furthermore, when at the Last Supper Jesus said "Do this in memorial of me he used the word anamnesis, which means more than simple remembering, but reliving,making present again, so Jesus was implying that he would continue to be among his disciples through the Eucharistic elements of bread and wine after his departure. The Christian church has tried to find a philosophical formulation for the real presence of Christ in the Eucharist. 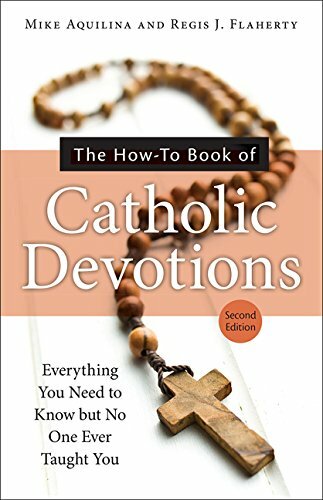 Roman Catholicism uses the term transubtantiation, which mean that the substance of bread and wine are changed but their appearances have not. Some other churches use consubstantiation,meaning that the elements remain bread and wine, but become linked to the risen Christ. It is possible to argue for hours about this issue, but what matters is the real presence of Christ among his people. 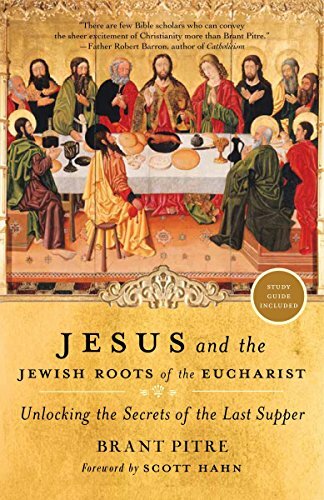 Ian Paisley, whom I mentioned earlier, was making a crude mistake in his theological understanding of Catholic teaching, but to be fair some Catholics make the same mistake.It is this.He believed that in Catholic thought Jesus is somehow contained inside the Eucharistic bread and wine. This presents a diminished view of Jesus. For people like Paisley this diminished view of Christ was a form of idolatry, and he would have a case.But this caricatures Catholic teaching. The truth is that to understand the Eucharist [can we ever!] you need to understand the nature of the Church, for the Church and the Eucharist are integrally bound together.The Church, according to Catholic teaching,is the body of Christ. This means that it is a community of baptized believers with the risen Christ at its heart.Christ permeates the Church through the presence-power of the Holy Spirit which is given to all believers, It is therefore a reality both sacred and worldly, a sign of God's presence in the world, though sadly subject to human flaws, as we have found out to our cost. Every community needs to gather together at regular times to express their solidarity and bond with each other. For example, families gather at meal times; and this is what Jesus and his disciples did on regular occasions. They shared table fellowship. The Last Supper was the final occasion when this fellowship was shared. But Jesus wanted it to continue,just as he wanted his community to continue. Thus the Eucharistic sharing of bread and wine continues the table fellowship that Jesus shared with his disciples. Just as the shared meals were an expression of the community life that Jesus and his disciples shared, so the Eucharist [mass,Lord's Supper] is the visible expression of the bond that church members share with each other. To participate in Eucharist is to take part in the life of the church. Participating in the life of the church is belonging to a community with Christ at its centre, and therefore Catholics believe that at mass Jesus Christ is present. The visible sign of the presence of the living,risen Christ is the consecrated elements of bread and wine.Just as a living human body is the sign of the presence of a person, so the sacred elements are the signs of the presence of the living Lord. We would say,therefore,that they are the vehicle through which the real presence of Christ is manifested in the Church. 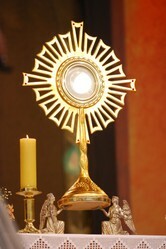 Christ is present at the service and the Eucharist is the visible sign of this. But what is the significance of eating the sacred elements? It is not widely appreciated that Christianity places great emphasis on the body, for what happens to the body is what happens to a person, and what we do in the body we do in the soul. The Church look forward ultimately not just to the soul being in heaven, delightful though that will be, but to the final consummation of human history when all the saved will share in Christ's resurrection, for we are unfulfilled if we are disembodied. The body will be saved as well as the spirit. 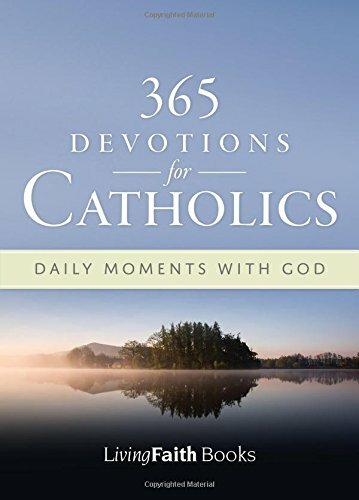 Catholics, like all Christians,yearn for an intimate relationship between Jesus and themselves, and through him and the Holy Spirit to God the Father. To accept Christ into one's soul and make him part of your life is to live the Christian life to the full. John's Gospel speaks of Christ's being the vine while his disciples are the branches, and this passage intimates that Christ's life flows through the Christian's soul. Eating the body of Christ in the context of a Eucharistic service is a means by which Catholics express and achieve intimacy with Christ. The Eucharist is one of the seven sacraments, sacred channels by and through which Christ is mediated to his people through the agency of the Church. Along with baptism it is one of the two sacraments accepted by most of the Christian churches, though understandings of it vary. That this mysterious ceremony has survived at the heart of worship in the Catholic and Orthodox traditions is a sign of its spiritual power. There are no physical sensations or pleasures attached to taking Eucharist [communion] in fact the bread is quite bland, and the response of individuals to receiving it is very personal.Some communicants might attain an emotional high, sometimes. But we must not confuse emotional and spiritual states. For me I am convinced that when I receive communion something is happening in my soul below [or maybe above] the level of consciousness. I must be content with mystery. In this article I have attempted to give readers a better understanding of the doctrine of the real presence of Christ in the Eucharist, but this is an article not a book,so there is more that could be said. I have not explained the concept of the Eucharist as a sacrifice, and I have said nought about Eucharistic devotions, which are rich and varied sources of spiritual satisfaction. I can give you a sip of mystery on a spoon, but I cannot bottle the mystery. 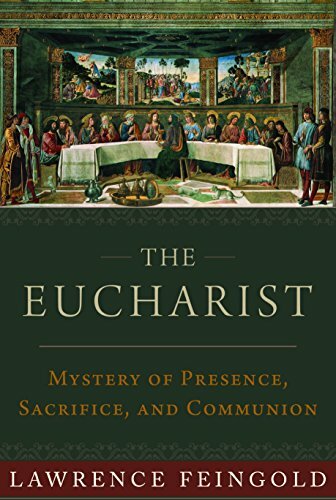 I like your comments that "the Eucharist [mass,Lord's Supper] is the visible expression of the bond that church members share with each other. 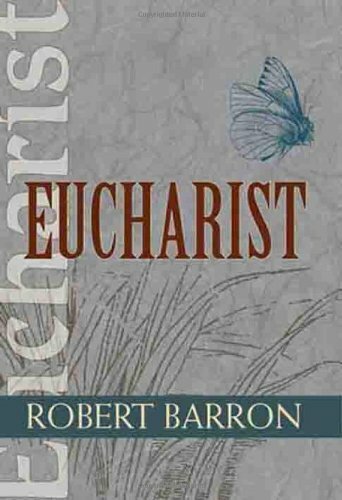 To participate in Eucharist is to take part in the life of the church." I also like the Orthodox view that it's the Holy Spirit flowing through the bread and wine, but why do they say Holy Spirit and not Christ? Derdriu, communion on Sundays is in both kinds. On weekday masses it depends on the priest's decision. If you want a sequel to my article there will be a sequel, but I will need to think about it, and I have to say that I have a book review planned, but that will take some time. The Old Catholics,who separated from Roman Catholicism after 1870, acquired their ordination from the bishop of Utrecht, who was in valid apostolic succession. So they are validly ordained. Later on some Anglo-Catholics, from the Church of England/Episcopalian church, had doubts about their ordination, as it derived from bishops not ordained as sacrificing priests, for they rejected the idea of the mass as a sacrifice. These worried Anglicans sought ordination from the validly ordained Old Catholic bishops, and hence any of them or their successors are validly ordained. Certain schismatic bishops are validly ordained for the same reason, for there was one schismatic bishop in the nineteenth century who dispensed ordination willy nilly! Yes BSG, I fully agree. But I see the entire redemptive act as being mediated through the living Christ who was crucified and rose again. frankbeswick, Thank you for the back- and front-stories and the product lines. Is there a tendency toward Holy Communion of one or both kinds on your side of the pond? 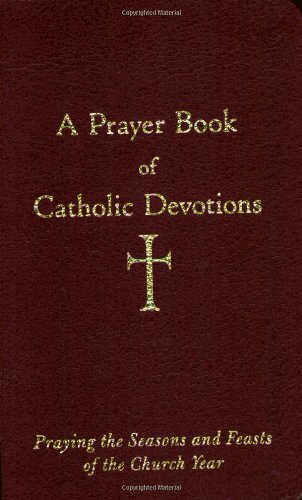 Is there going to be a sequel in the form of Eucharistic sacrifice and Eucharistic devotions? Since the last comment was lengthy, I thought this needed to be separated. We were told in parochial school that some religions, the Orthodox Church, and at that time the Lutherans and Anglicans, had priests who were ordained by bishops, who in turn were made bishops, in a direct line that remained unbroken to the Apostles. The consecrations they performed were actual consecrations. Now, I would feel comfortable with the Orthodox. I am not certain the lines in the other religions remain intact. I suspect you may have some insight on this. Frank, this is another deep article on religion. I appreciate you writing on such an important topic. When I took a Christology class, the theologian who taught the class said the Eucharist is the entire Redemptive Act, the events from Good Friday through Easter sunday, being made present in the eucharist, and certainly not a reenactment. This goes to God,s ability to not be bound by time, nor location. In fact, he remains in the Godhead in Heaven even while being present on Earth. This is more than we learned in religion class in parochial school. So, more than just being Jesus, it is the sacrifice, and the acceptance by God the Father of Easter. November 30th is celebrated by Scots throughout the world as St Andrew's Day; but what's the story behind a Byzantium saint coming to Scotland?